The blower with integrated controller has been the subject of an international patent. Its development, resulting from two years of research, was supported by OSEO Innovation. additional heating: for a rapid temperature rise, switching on or of the blower, instant heat. to keep a clear surface for hanging laundry or towels identical to that of a conventional towel rails. > The fins located in front of the blower are orientable upwardly, to optimise the air flow. > Easily accessible from the front of the towel rails, the removable dust filter can be cleaned with a little water and a sponge. > The controls are digital, easy to use and intuitive. > Precise TPI electronic control, the temperature remains stable over the seasons, the feeling of comfort is optimal. > LED viewing of operating modes, keypad lock, heating on cartridge and boost. > Visualization of the setting temperature, count the duration of boost and advanced settings on the display. > Help for the visually impaired : the switch button heating on/standby is in relief to be easily identifiable to the touch. > Thanks to their infrared receiver located on the front of the blower, the towel rails with blower Néomitis® are controlled remotely by the infrared remote control supplied. - Security level 1 : an integrated thermostat protects the towel rails with blower against any temporary overheating. 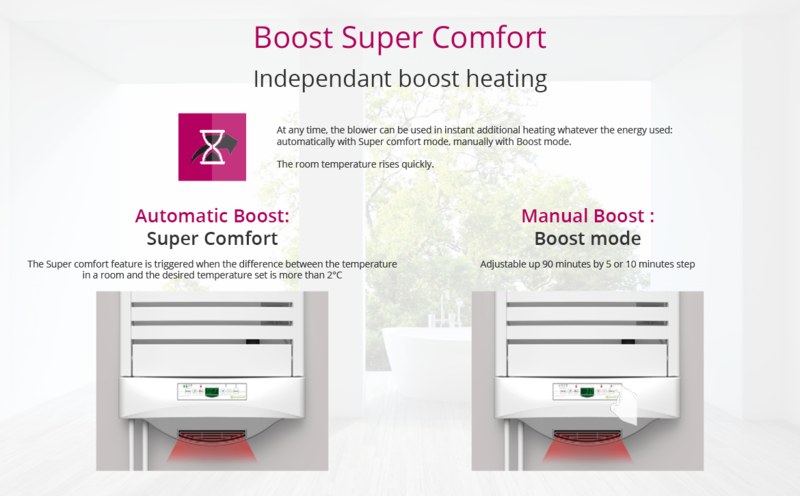 Limit of the ambient temperature in case of boost : when Boost is activated, the towel rails should heat the room up to a limit of ambient temperature. When it is reached, the boost stops automatically. "Keypad lock" unintentional changes are not possible, dispensation and modification possible by infrared remote control. Switch heating on/standby located at the bottom to prevent unintentional support. > "Hotel" anti-tamper : Full lock of controls except the boost. Dispensation and modification possible by the remote control only. > Security "anti-obstruction" : the ambient air enters behind the blower and exits through the fins on the front face, in the lower part of the towel rail. 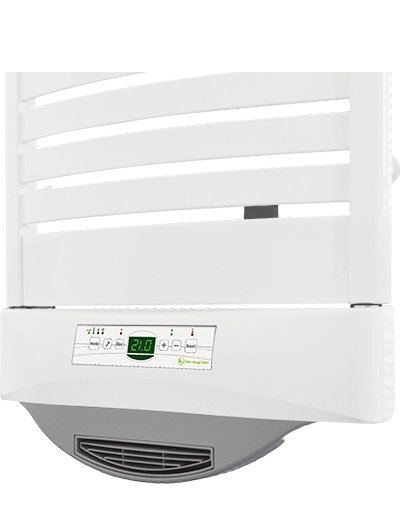 In case of accidental blockage of ventilation grille or dust filter, the device switches to safety mode and the blower stops automatically.